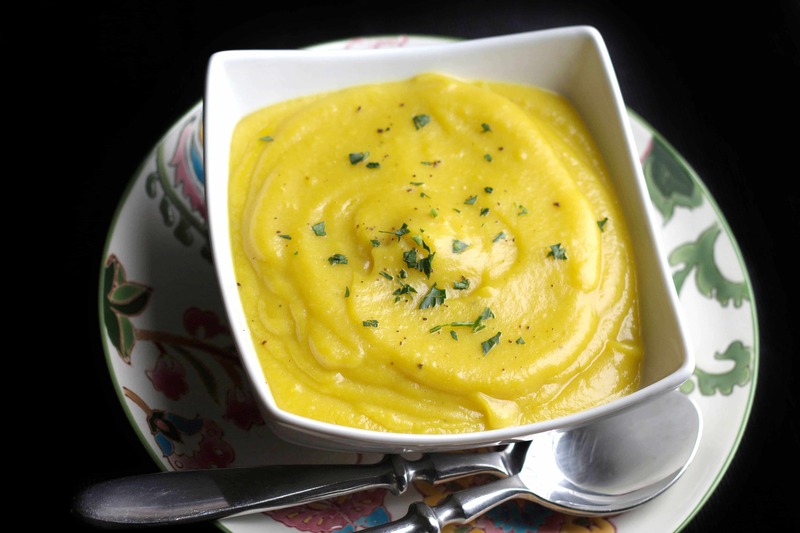 This recipe for Low Fat Creamy Cauliflower Saffron Soup makes a delicate, soup with subtle flavors and velvety texture. 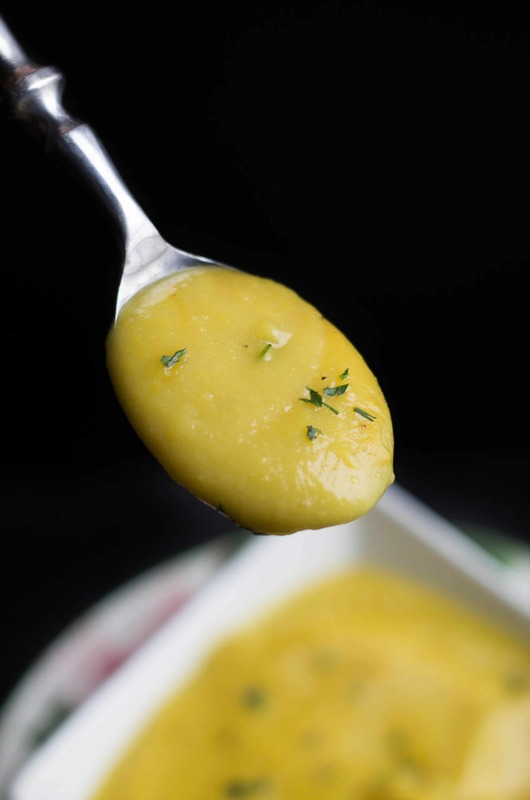 Adding a potato to the soup instead of cream gives it a creamy texture without the added calories. Albeit flavorful, this is a subtle soup. 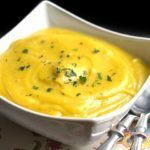 If you are looking for an intense soup with big flavors, this is not the soup you’re looking for, but I happen to find it elegant and delicious. I’ve made it for lunch and serve it with warm bread, but it also makes a lovely starter for dinner parties as well. 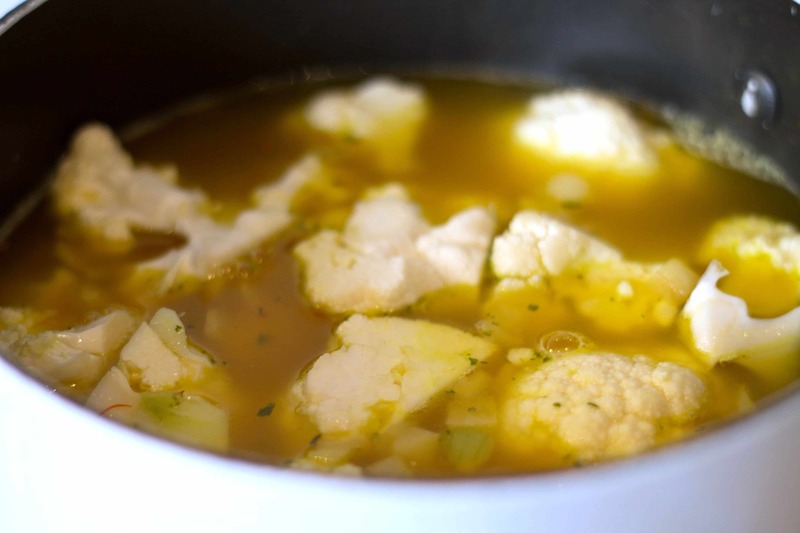 A friend describes it as ‘A soup that will make you a cauliflower fan even if you’re not.’ Even kids love it. Because it’s so bright in color, they don’t know it’s a vegetable soup and it’s a winner every time! This is also one of those recipes that tastes even better a day after making it. I often make it a day ahead and re-heat it to serve. Add the chicken stock in medium saucepan and bring to simmer. Remove from heat and add the saffron threads. Set aside to steep. Heat the olive oil in medium pot over medium-low heat. Add chopped onions & celery; sauté until quite tender but not brown (about 5 minutes). Add the garlic and cook another minute. Add the cauliflower & potato; stir to coat. Add saffron stock. Bring to a boil over high heat. Reduce heat, cover, and simmer until the cauliflower & potato are tender (about 20 minutes). 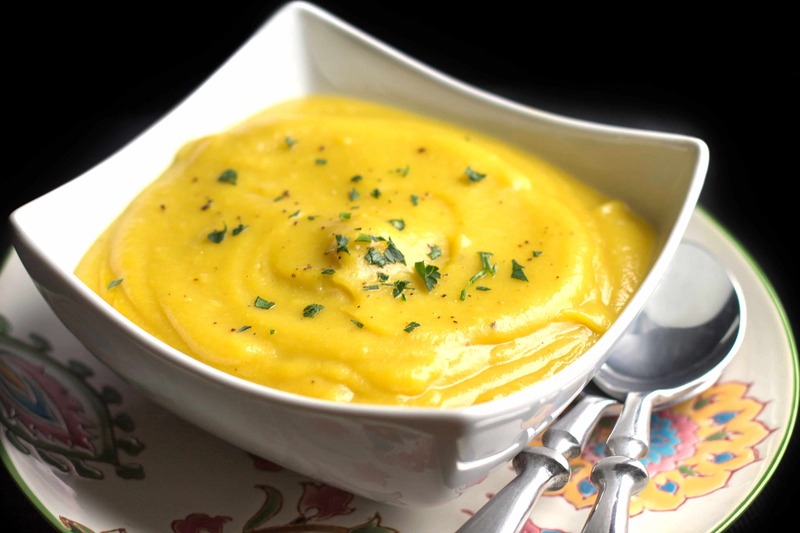 Using a hand blender or food processor, puree the soup until smooth. I am avoiding potatoes so I did this soup with celery root – which thickens and adds a great flavor to it. Just cube like you would a potato and enjoy. 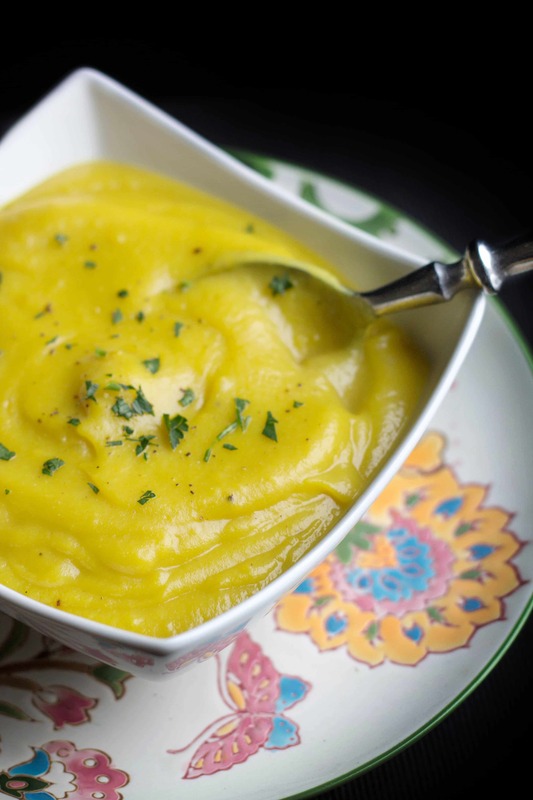 Very good alternative for those avoiding the carbs of regular soups. Delicious. This soup is so incredibly good! Isn’t it? Love it too! Thanks for the feedback, Gina! This soup looks delicious! In the directions you mention butter but there is no mention of it in the ingredients. How much butter do you use? Also, the soup looks so creamy like it has been blended in a blender or food processor yet you don’t mention that? Can you be more specific on how you get it so creamy? Thank you!